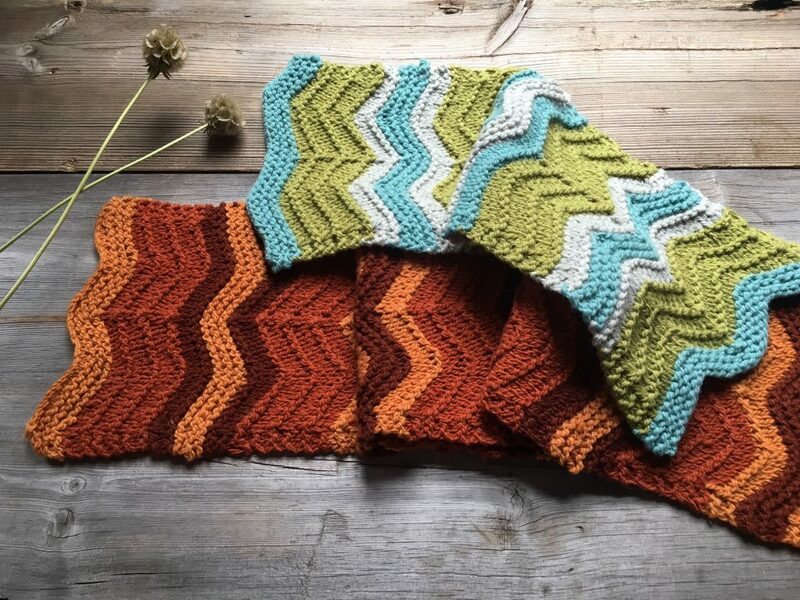 The Grant Scarf, from Juju’s Loops, in three colours, is our ‘go-to’ pattern for a chunky chevron scarf. 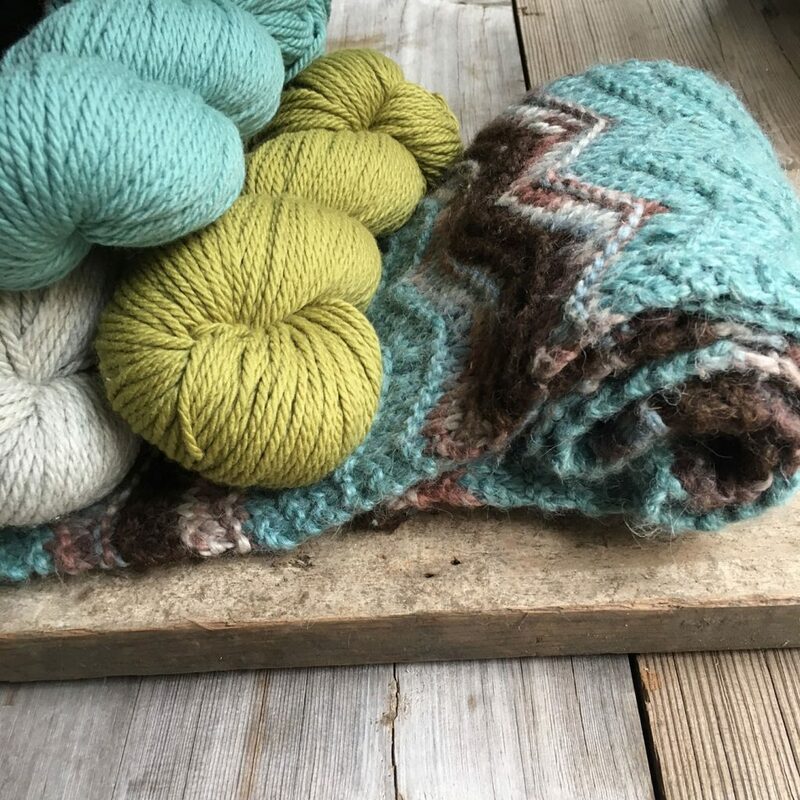 It was designed to use exactly 2 skeins of the Misti Alpaca Chunky and 1 each, of two other colours. Misti Alpaca Chunky is a very soft and seductive yarn. However, some men find that the fluff of the Alpaca is not ideal for bristly beard hairs. 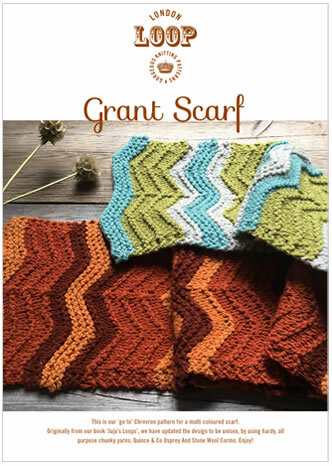 For them, we have redesigned Grant in hardy, chunky yarns. It’s perfect as a unisex scarf or for a quick knit to stave off the last of the chill before Spring fully kicks in. We’ve used Quince & Co, Osprey and Stone Wool Cormo for our samples. These are shorter than the full length scarf made from our pattern, which is a free download! We have changed the airy, yarn-overs in our original patter, to “make-one” stitches, so that it’s not as lacy, and we mirrored the design around the contrasting colour garter sections, to make it more interesting. 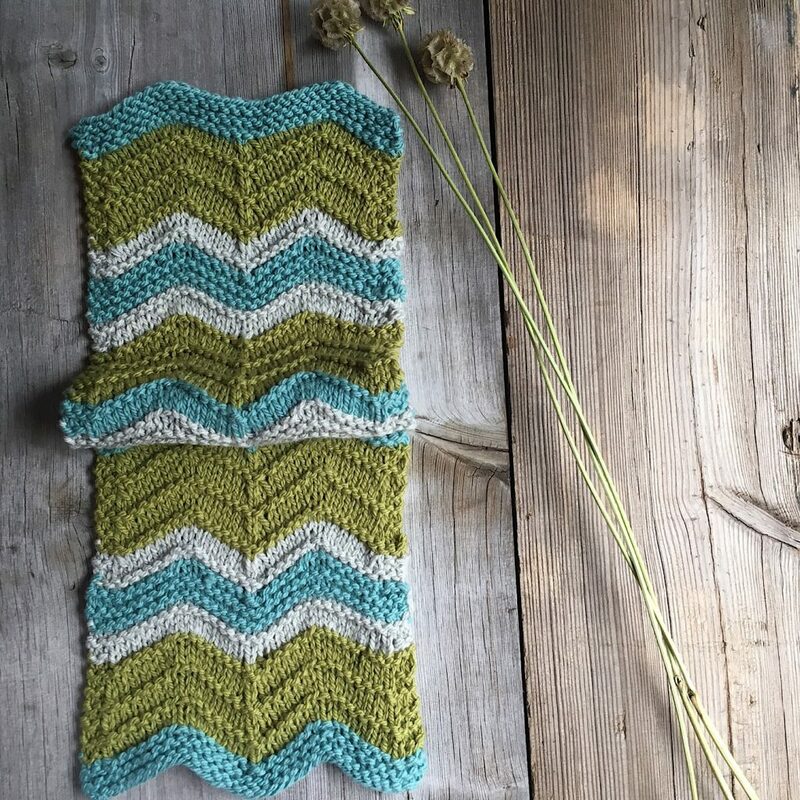 You can make this scarf with one skein of each colour, resulting in a length of about 223cm (2 and a half yards). 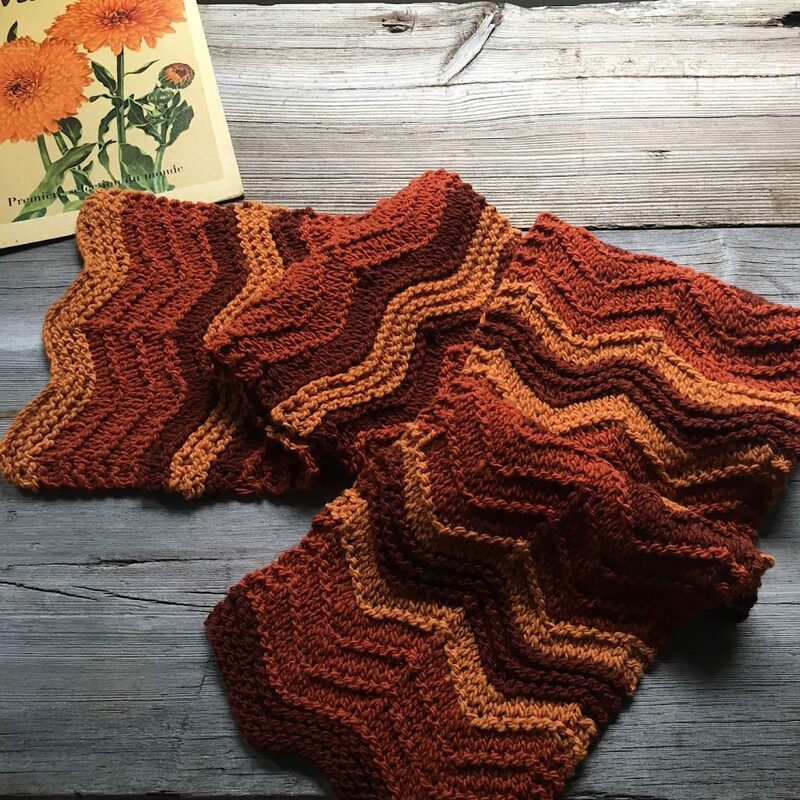 With our updated version, you’ll have some left-overs in the two contrasting colours (B and C in the pattern) or you can dive into a second skein of the main colour (A), for a scarf that will grow to about 4 and a half metres in length. Our original sample from Juju’s Loops uses Misti colours in combination with a Misti hand paint yarn. The colours we used in our original are (or close to): hand paint; Dark Chocolate and Natural Brown and Blue Lake in the Solid. Here you can see the original scarf rolled up next to one of our new yarns choices. 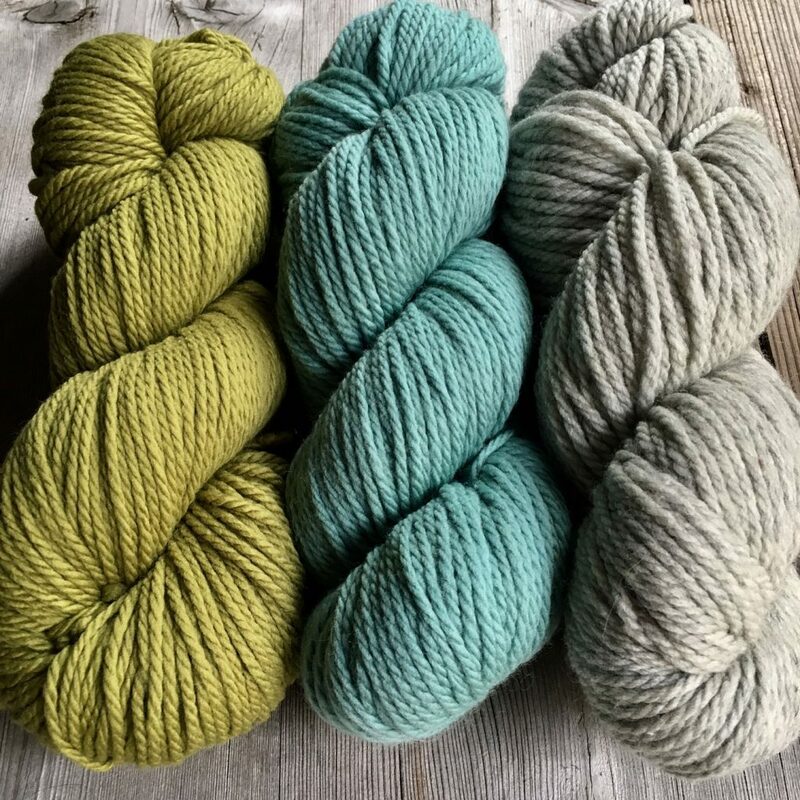 This is the lovely Quince & Co, Osprey in Split Pea (green), Belize (blue) and Frost (pale grey). 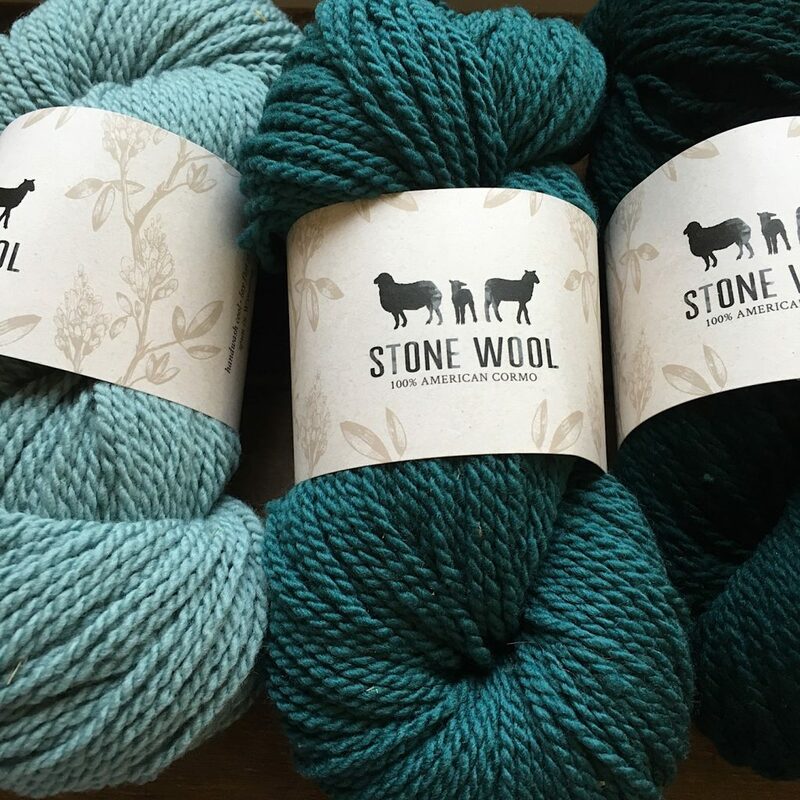 Our next sample is Stone Wool Cormo, which comes from sheep on farms in Wyoming and Montana. The Stone Wool has an incredible spring to it, combined with wonderful stitch definition. Each of the six colours comes in a gradient of three shades. We chose to make our scarf from all three shade of the Osage colour palette. But we also love the idea of using the Ozark (blue-green) palette. 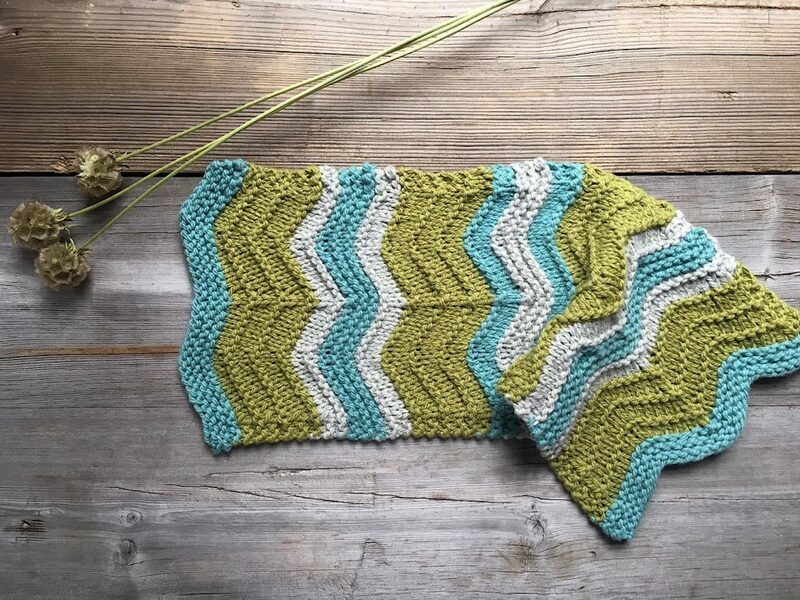 You can make this pattern in any yarn. A chunky weight will result in the 19cm width but you can repeat the pattern stitches, making it suitable for a thiner yarn. Be careful to weave in your ends properly, for at least 6 stitches. If you are using a yarn with Alpaca, it’s a good idea to work the yarn end for even more stitches, as Alpaca has a bad habit of escaping. Use a sharp darning needle for this and pierce the yarn as you weave in the ends. The link will take you to the Ravelry page where the shawl is for sale. Ravelry will take charge you in your own currency.